Encinitas is a California beach city located in San Diego County about 25 miles north of the city of San Diego and about 95 miles south of L.A. 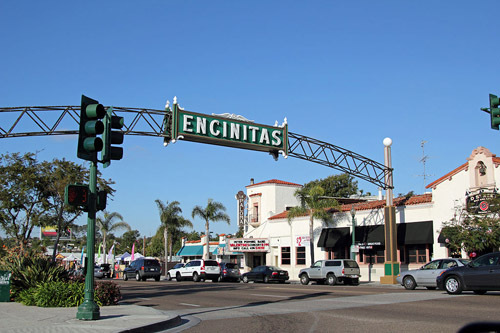 The name Encinitas means "little oaks" and it spans 20 square miles 1.2 square miles of which is water covered. The area features bluffs, rolling hills, beaches, cliffs and a mild Mediterranean climate perfect for outdoor activities and events. The city is a combination of several smaller communities like Cardiff-by-the-Sea, Olivenhain, Leucadia and Old and New Encinitas that were united to create the city of Encinitas at its incorporation in 1986. The first residents in the area that would one day be Encinitas were native people of the Dieguitos, La Jollan and the Dieguinos. In 1800, the area was governed by Mexico and all land grants were given by hem. Jabez Pitcher is considered by some to be the father or founder of the city. In 1881 Pitcher filed a land cliam for 160 acres ear the railroad tracks and founded the settlement of Leucadia. Cardiff-by-the Sea was founded in 1875 by the Mckinnon family. It was not until the combining of five smaller communities in 1986 that the modern city of Encinitas as formed. Today the original communties retain thier individual charms and styles giving the city a diversity of architecture, atmosphere and life styles. According to the United States Census of 2000, Encinitas was home to 58,014 residents spread across 22,830 households giving the city a population density of 3,035.6 people per square mile. By 2010 the new census revealed that the population had risen to 59,518 and the new population density was 3,000 inhabitants per square mile. In 2000, the median household income in Encinitas was $63,954 and the median family income was $78,104. However, according to a 2012 estimate from city-data.com the median household income had risen to $86,505, well above the state's estimated median income of $58,328.The city has wonderful stretches of sandy beaches, unique shops and dining establishments and a historic mix of architecture in areas like the coastal shopping district of Downtown 101. Points of interest in Encinitas include Swami's-a popular surf spot, the San Diego Botanical Garden featuring an Amazon Rainforest and the largest display of bamboo in the world, La Paloma Theater, Moonlight beach and so much more. The city hosts a number of cultural events and fairs like the April Street Fair, OktoberFest, and The Wavecrest Woodie Meet. Homes in the city run the gamut from modern starter homes, apartments and condominiums up through large tract homes and luxury beach homes. There are five sections or neighborhoods in the city Cardiff-by-the-Sea is a largely residential oceanfront neighborhood featuring the Lux Art Institute. Olivenhain is semi-rural and features several private equestrian centers and a variety of single family homes. Leucadia is another coastal community with quiet tree lined streets a collection of art galleries, stores and single family homes. New Encinitas is a modern neighborhood and his home to shopping centers, golf courses and large tract homes. Old Encinitas is a beach-side neighborhood with a mix of houses. Local real estate agents are best suited to helping you find the home of your dreams in sunny Encinitas, California.